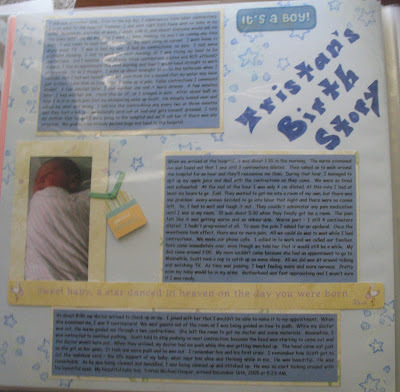 So, after Tristan was born, I started a scrapbook. He is now 2 1/2 years old and I've only managed to finish 14 pages. I really need to get on top of things if I want to start one for baby girl. But....I'm out of ideas. Being a new mother, I couldn't resist the urge to take as many pictures as possible. Every coo, smile, funny face, I wanted to capture on camera. These 12 photos were part of a larger group of 50 or so photos. He was just absolutely adorable! Besides my own joy of having Tristan in the world, here were a bunch of cards from my shower welcoming him to this world. Two of which were hand made cards - I love the personal touch. It was somewhat of a disaster -my friend that was putting the party together backed out less than a week out from the event - so my mom, my good friend Sharon, and I put the party together - I know it mostly goes against etiquette but my other choice was to cancel - the invites had already gone out. Anyway, despite the setback, the shower went well. It was mostly co-workers that came. We had a ton of food, games, and prizes. Some of my favorite gifts from the shower were hand made blankets. Tristan still uses both of them to this day. Of course, I couldn't forget to include my ultrasound pictures. It is very subtle, but the border I chose for this layout is shaped like an ultrasound arch. I probably should have chosen a darker border color, or a darker background color so it is more noticeable. Cradling Tristan in my arms, I took a few pictures of his peaceful slumber. I can't believe that he was ever that small! I wanted to display our hospital bands somehow. Using leftover clips from the baby shower, some twine, and two brads, I fashioned a make-shift "clothes line" to hang the bands from. 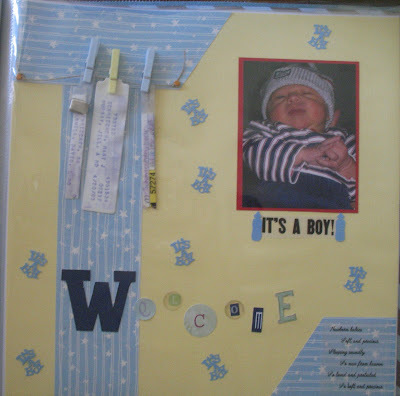 The little bottles and "It's a Boy" scattered throughout the page are actually confetti from the baby shower. 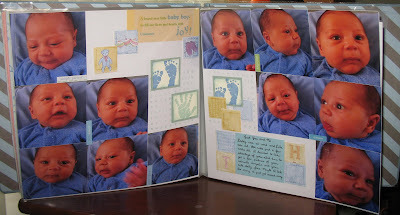 This layout is mostly Tristan's birth story. From first contractions to delivery. I thought it would be a nice addition to the scrapbook. So there you have it. 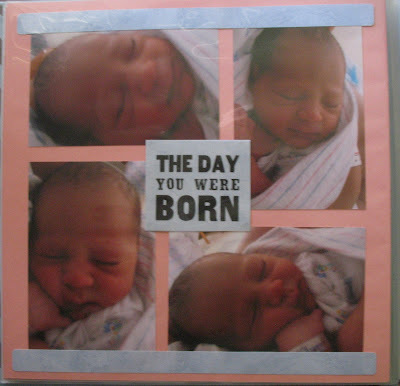 They aren't the best layouts, especially since this is my first real experience with a scrapbook. 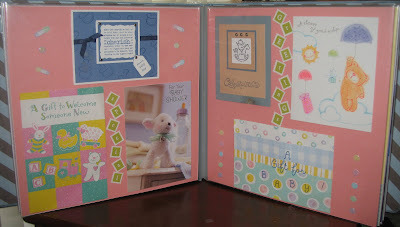 Now, I really need to get out my picture box, my scrapbook materials, and start up again. I only have two+ years of pictures and experiences to chronicle. My goal is this: to get his first year done before baby girl comes. Then we can see about the rest. 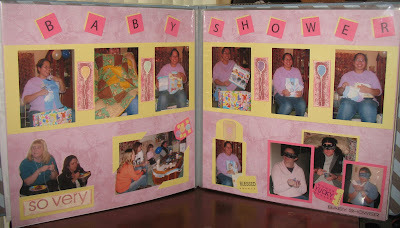 To reach my goal, I'll need to dedicate a few hours each week to my scrapbook, search around for ideas, and probably spend a bit of money on printing out photos. As I get a page done, I'll take a picture of it and post it.